Find out where you can see our Forever First Lady. Michelle Obama just announced plan to embark on a 10-city tour to promote her highly-anticipated memoir, Becoming. She will make stops in Chicago, Los Angeles, Washington, D.C., Boston, Philadelphia, Brooklyn, Detroit, Denver, San Jose and Dallas and treat fans to intimate conversations about her life and her journey to becoming our nation’s first Black First Lady. “I’ve spent the last year and a half reflecting on my story as deeply and honestly as I could, and now I’m thrilled to travel the country and do the same with readers this fall,” she says in a new video released Wednesday. “Over this time that I’ve been out of the White House, I’ve had time to think and reflect for the first time in a long time. I spent some time really thinking about the people, the stories and the experiences that have shaped me and helped me become the person I am today,” she explains in the video. Our Forever First Lady is hoping her story will inspire people around the world and we’re pretty sure it will. Michelle Obama is making sure that everyone has access to this incredible opportunity by donating ten percent of the seats in each city to people who can’t afford to purchase tickets. Prices start as low as $29.50 and will be sold through Ticketmaster. Registration for the “verified-fan” pre-sale of tickets is open now through Tuesday, Sept. 18 at 10 p.m. PT. 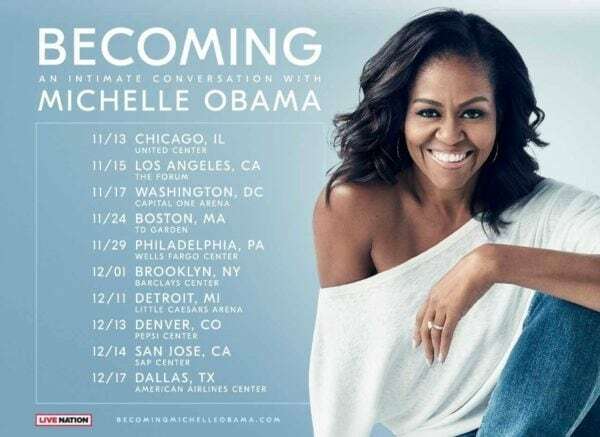 Tickets for the tour will go on sale to the general public starting Friday, Sept. 21 at 10 a.m.
Get more info here: BecomingMichelleObama.com.